Jess Bechtelheimer created paintings for âGertrudeâs Tahoe Adventures in Time,â capturing the magic of Lake Tahoe. “Gertrude’s Tahoe Adventures in Time,” a children’s book about the natural history of Lake Tahoe, was recently published. 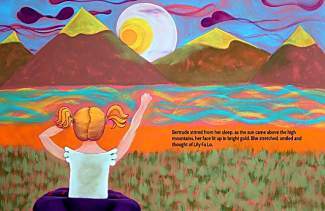 With colorful and dramatic illustrations, the book tells the story of Gertrude, a Tahoe girl who meets a magic maiden. The maiden takes her on a fast-motion adventure through Lake Tahoe’s history. They watch glaciers march, volcanoes erupt and exotic animals graze while becoming forever friends. Gertrude is illustrated by Jess Bechtelheimer, who worked hundreds of hours to create the paintings, which are the backdrop for the book. It is available for purchase at The Bookshelf in Truckee; Ruffles and Ruffnecks, The Store and The North Lake Tahoe Visitor Center in Tahoe City; Tahoe Mountain Sports in Kings Beach; Sundance Books and Grass Roots Books in Reno, and online.